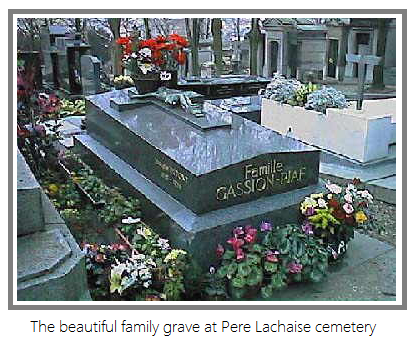 Edith Piaf was born on 19th December 1915 as legend tells it "under a gas light on the night streets of Paris." In reality she was born in a local hospital. Her real name was Edith Giovanna Gassion. Her Father was an acrobat, performing the streets of Paris, her Mother a street singer with no care for her new born child. For years she struggled making a living entertaining passers-by, for some time she worked with her Father, until she was spotted by an impresario who offered her a contract. 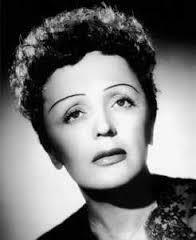 With many problems throughout her career, Edith eventually became the most highly paid star in the world. She made many recordings dating from 1936 until her last recorded song, L'homme de Berlin, which she taped in early 1963. Edith did not die a rich woman. In fact she left many debts to her second husband, Theo Sarapo, a man many years her junior, but she lived her short life to the full, living only to entertain her public in the only way she knew how. I can only appreciate this woman through her recording and biographies of her life, I wish she could have hung on a little longer !